More than 90% of the respondents in an independent national survey by the Pew Research Center’s Internet and American Life Project said that libraries are important to the community. School libraries continue to feel the combined pressures of recession-driven financial tightening and federal neglect, according to the survey, and school libraries in some districts and some states still face elimination or deprofessionalization of their programs. 96% of Americans agree that public libraries are important because they provide tech resources and access to materials, and the same number find libraries valuable because they promote literacy and a love of reading. More than 90% of traditional public schools have a school library, but public schools continue to struggle with the impact of funding cuts and reductions in professional staffing. A perennial highlight of Banned Books Week is the Top Ten List of Frequently Challenged Books, compiled annually by the ALA Office for Intellectual Freedom (OIF). The OIF collects reports on book challenges from librarians, teachers, concerned individuals, and press reports. A challenge is defined as a formal written complaint filed with a library or school requesting that a book or other material be restricted or removed because of its content or appropriateness. In 2013, the OIF received hundreds of reports on attempts to remove or restrict materials from school curricula and library bookshelves. “Print remains the foundation of Americans’ reading habits,” the Pew researchers found. Most people who read ebooks also read print books, they reported, and only 4% of readers described themselves as “ebook only.” After years of conflict between publishers and libraries, 2013 ended with all the major US publishers participating in the library ebook market, though important challenges, such as availability and prices, remain. In November 2013, after eight years of litigation, a federal court upheld the fair use doctrine when it dismissed Authors Guild v. Google, et al., a case that questioned the legality of Google’s searchable database of more than 20 million books. In his decision, the judge referenced an amicus brief coauthored by the ALA that enumerated the public benefits of Google Book Search. The Authors Guild has filed an appeal. More and more public libraries are turning to the use of web technologies, including websites, online account access, blogs, rich site summary (RSS) feeds, catalog search boxes, sharing interfaces, Facebook, and Twitter. The economic downturn is continuing at most institutions of higher learning, and academic librarians are working to transform programs and services by repurposing space and redeploying staff in the digital resources environment. President Obama signed a $1.1 trillion spending bill in January that will fund the federal government through September and partially restore funding to the Library Services and Technology Act (LSTA)—the primary source of annual funding for libraries in the federal budget—that were dramatically cut in the 2013 fiscal year under sequestration. 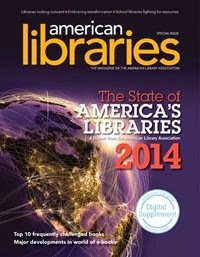 The full text of the 2014 State of America’s Libraries report is available on the ALA website. It is also available as an American Libraries digital supplement.